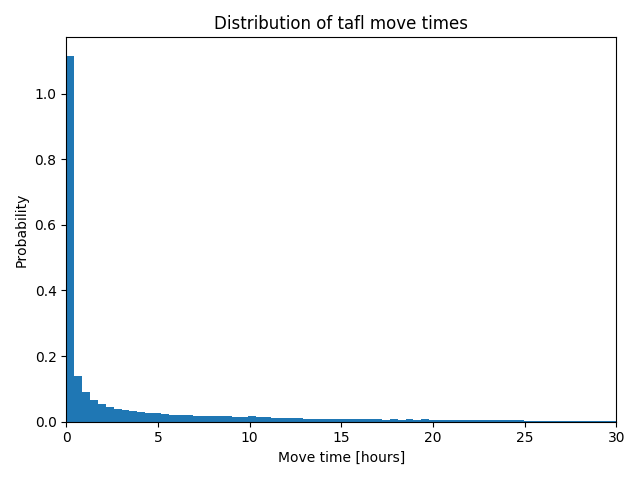 Distribution of tafl move times. 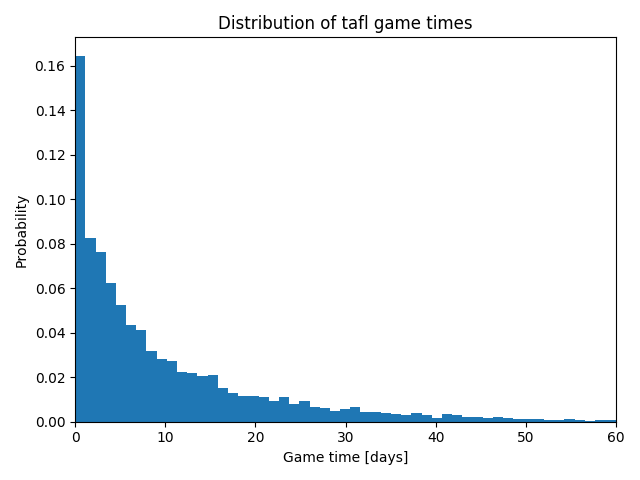 100000 tafl moves drawn from games since 2015 were analyzed for move times. The diagram shows that this site has fast players! Probability of tie in a match of two games of Copenhagen Hnefatafl, when the players are equally strong. The match is a tie if both players win as black or if they both win as white. 60% * 60% + 40% * 40% = 52%. 60% * 40% + 40% * 60% = 48%. So the outcome (tie or winner) of a two games match of Copenhagen with two equally strong players is like flipping a coin. The probability of one tie is 52%. The probability of two ties in a row is 52% * 52% = 27%. The probability of three ties in a row is 52% * 52% * 52% = 14%. This is a very interesting statistic. I would prefer this method of tiebreaker (opponents playing two additional games), opposed to tiebreakers like game length or pieces captured. Or as I previously suggested, if players split games in consecutive rounds, each winning a game as black and a game as white, then I think the third round tiebreaker should only be one game to decide the winner. Which player plays which color should be decided randomly, either by a coin flip or a hat pull, by the umpire. In the event of a tie in the fifth game, players would switch colors and continue playing until a winner is found. If players split games in two consecutive rounds (the round robin round and the addition tiebreaker round, no previous rounds), winning all games as either black or white, then perhaps we could use tiebreakers of game length or pieces captured to determine a winner. Although I am opposed to such tiebreakers, I understand this is the real world and players can potentially continue to split games. So, such tiebreakers is could at least be a means to find a winner. Anyways, the need for an extra tiebreaker round has been rare to this point. I think for sure we should not go past a third round to determine a tournament champion. Depending on the players playing pace, the games could potentially last for months. This is all just food for thought moving forward. I don’t know what’s the best tiebreaker method. I just prefer playing games not having to worry about game length, pieces captured, or if you lost a game to a weak or strong opponent. Probability of tie in a match of two tafl games as consequence of game balance. More ties means simultaneously fewer matches with a winner. (Fx. Copenhagen bal. +1.51, Fetlar bal. +1.41, Sea Battle 9x9 +1.55, Brandubh +1.32 and so on). That's not as balanced as chess. But real game balance is very diffucult in an asymmetric game, and given that the asymmetry is part of the charm of this particular game ... that kind of game balance is really good enough. I think if a variant of hnefatafl or any tafl game is too balanced, it does begin to lose some of its charm. This is an interesting view! Perhaps part of the explanation, why the Copenhagen Hnefatafl (game balance +1.51) functions so well? This is a very interesting statistic. I would prefer this method of tiebreaker (opponents playing two additional games), opposed to tiebreakers like game length or pieces captured. If players split games in two consecutive rounds (the round robin round and the addition tiebreaker round, no previous rounds), winning all games as either black or white, then perhaps we could use tiebreakers of game length or pieces captured to determine a winner. Although I am opposed to such tiebreakers, I understand this is the real world and players can potentially continue to split games. So, such tiebreakers could at least be a means to find a winner. Anyways, the need for an extra tiebreaker round has been rare to this point. I think for sure we should not go past a third round to determine a tournament champion. Depending on the players playing pace, the games could potentially last for months. I just prefer playing games not having to worry about game length, pieces captured, or if you lost a game to a weak or strong opponent. After several unlikely events this year, perhaps we should prepare for the eventuality that the players will tie the playoff on both points and rating? We should consider comparing number of pieces taken (adding white and black pieces from the round as a whole for both players). This would most likely solve the issue. I think you're on to something regarding more criteria to avoid rematch. Besides captured pieces there's also such a thing as game length. I would look for numbers, which indicate elegant play. A player who fx. goes right in and wins in few moves, perhaps even without capturing any pieces, is a tafl genious (or else his opponent made a giant blunder). So, short game length as a criterion seems to give a reasonable result. I like your idea of awarding for game economy, an excellent decider. Or else we could find ourselves waiting for 21 games like Fischer/Spassky. I suppose we could let them play forever, until one of them gets better at playing white? It is an interesting conundrum though. Two players who have advanced equally as black above the rest, locked in a final until one discovers a new tactic for white. could've been if it was invented before the tournament. (This I wrote because the 3rd round games were very interesting and high quality). It is important that the fair Championship winner is found - the fair winner independent of the tournament rules. Game length and count of captured pieces can be auxiliary rules to rank tournament results when they are otherwise identical. But they cannot be used to determine who goes to the top final or who wins the top final. - either new rounds continue until one wins, perhaps because he in the process invents new and better strategies. - or the tournament could end with round 3, using the two auxiliary rules to spare the players' time. Which board sizes and which game types have been more popular during the latest two years? Interesting. Even if you take out the Copenhagen games (which may be high due to World Championship etc), the 11x11 board is the clear favourite size. I think perhaps because a bigger board in general makes for a longer game with more strategy options, but too big a board becomes unamanagable, and games can be too long. Which board sizes, game types and variants have been more popular during the latest three years?